Renting a bike at Orange Peel a refreshing experience. By stocking a wide variety of rental and demo bikes, we make riders of all ages, sizes, and styles happy! Looking to wheelie to the donut shop? Hoping to drag grandma and the kids down the bike path during your Steamboat vacation? Want to check out our local mountain bike trails on a high-end demo bike? We have you covered. Check bike options and rates below. Decide on your sweet rig, tuned and ready to ride. Read the Bike Rental Details below. They are important. Standard Rental Bikes are first come, first served. If renting a Premium Demo Bike, reserve your bike by calling 970.879.2957 or email rentals@orangepeelbikes.com. or walk in and see what we have available! Are you looking for a high performance bike to enjoy while visiting northwest Colorado? Thinking about purchasing a new bike, but would like to test ride a few first? 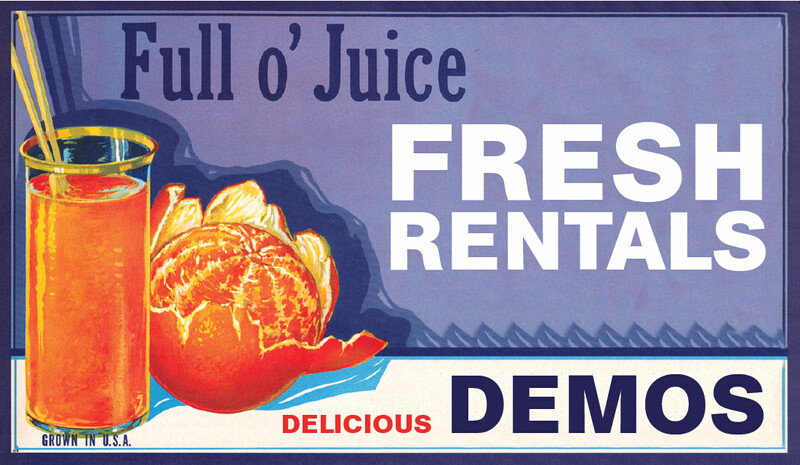 The delicious demos at Orange Peel are what you are looking for! We offer some of the tastiest bicycles available, in varying levels of awesomeness to meet your needs! Reservations recommended. We carry an excellent selection of rental bikes for all purposes to outfit your Steamboat Springs vacation. Standard Bike Rentals are first come, first served. Sorry, NO RESERVATIONS on standard rentals. Fleet includes Including Hardtail Mountain Bikes, Fat Bikes, Road Bikes, BMX, Cruisers, Kid Bikes. All are tuned and ready to ride. Reservations recommended. Call 970.879.2957 or email rentals@orangepeelbikes.com. Standard Bike Rentals are first come, first served - Sorry, NO RESERVATIONS. Reservations require prepayment of our full, single day rate for each bicycle being rented. Cancellations require 48 hours notice, or NO REFUNDS. Unless other arrangements have been made, bikes must be dropped off 1 hour before closing on the last day of your rental. We will make an imprint of a credit card for a deposit on the equipment. Your rental must be paid in full before leaving the shop. Damage and excessive wear to the bikes is your responsibility. We recommend our damage waiver program for those who are prone to accidents. Our OPTIONAL damage protection waiver is an inexpensive way to feel confident when you rent and demo our bikes. The cost is $25 per bike to be purchased before you ride, and applies to the entire duration of your rental. It covers any damage to the bike up to $499 retail value, and any damage above this amount you are responsible for just 50% of the retail price. (This includes a total loss, such as from a bike flying off the roof of your car!) We highly recommend this added protection, as most of the damage to our bikes has historically been items covered completely, such as bent wheels, broken derailleurs, and slashed tires. And please remember, regardless of whether you purchase damage protection or not, YOU are ultimately responsible for the bike you rent.